LED candles are a safe and convenient flameless solution for venues where real flame lighting is not an option. 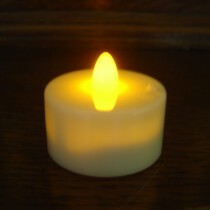 With a soft glow, realistic flicker and a range of colours, they make a great alternative to real flame candles. We offer Australian customers, both retail and wholesale, our superb range of LED candles, which includes single battery-operated units, rechargeable sets, lamps and holders. Everybody loves the ambience of candlelight. But sometimes, starting an open flame simply isn't an option for lighting your venue. Cruise ships, outdoor settings and heritage buildings are all venues where it may be impractical or impossible to use real-flame candle lighting. So how do you capture the warmth and romance of candlelight, with no flame? If you need the next best thing to a real flame, then flameless LED candles are the answer. Our battery electric candles feature a long-lasting LED globe, which will glow and flicker just like a real candle. Paired with a decorative lamp or candle holder, LED candles are the perfect solution for any venue where fire is strictly not invited! When you're trying to set the mood, nothing is more distracting than a flashing light. On the other hand, a constant LED light is often harsh and unpleasant. 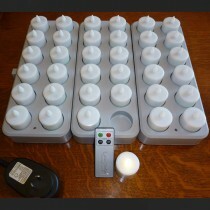 The solution is a smart "flicker" algorithm, which mimics the subtle behaviour of real candlelight. Our flickering flameless candles provide pleasant, realistic lighting that will help you create the perfect atmosphere. It really is the closest thing to real candlelight! 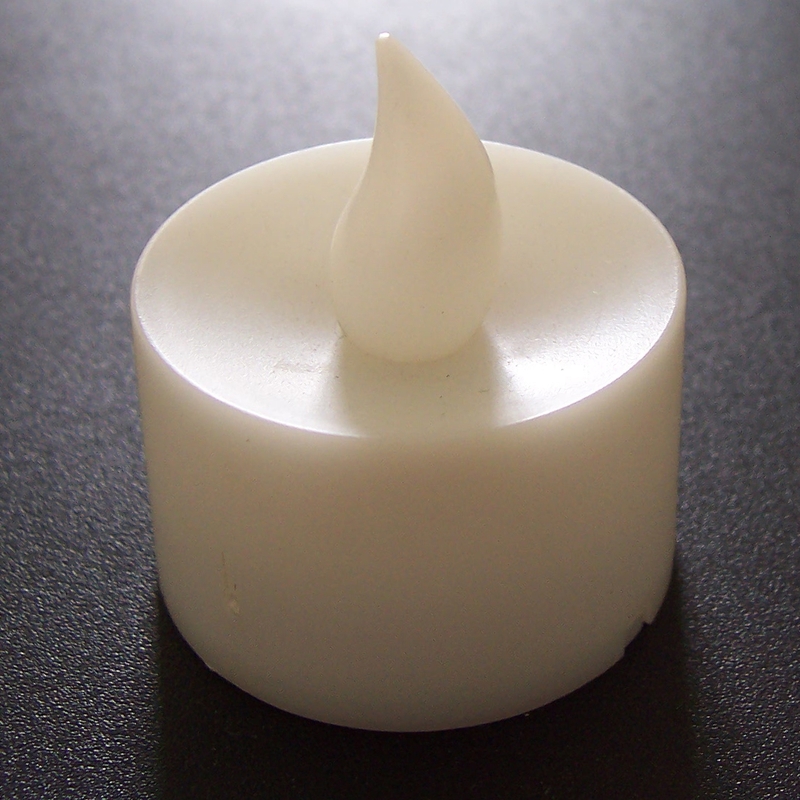 One of the main benefits of electronic LED candles is safety. There are many cases where even a small candle flame could be a risk. For example, you may be holding an event in a heritage building, where the rules prohibit open flame. Another case might be where you expect many children to attend an event. When safety is important, battery operated LED candles provide a great alternative to traditional candles. They carry no risk of injury or fire damage and don't generate heat. They also don't leave any soot or wax for you to clean! So if safety is your priority, try our flameless battery candles for the convenient LED solution. The Cool Candles range of LED candles includes rechargeable sets which come complete with a charger, a remote control and timer. This style of LED table lighting is extremely convenient for restaurants, bars and social events like weddings and conferences. 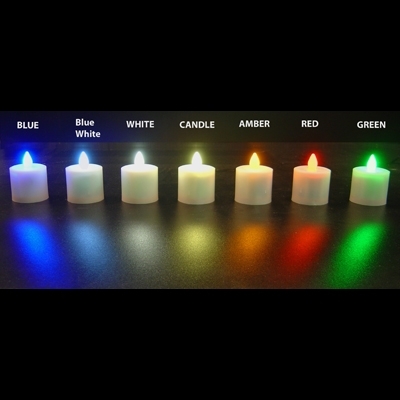 Our rechargeable LED candles are available in bulk quantities, with up to 60 pieces in one convenient set. Business and venue owners can also take advantage of our fantastic wholesale prices. More than just a replacement for flame, our battery candles offer energetic and colourful lighting that demands attention. With heaps of colours and tints available, you can easily create a lighting scheme that's unique to your venue. As a business owner, you can also enjoy wholesale pricing on bulk lamp/holder purchases. 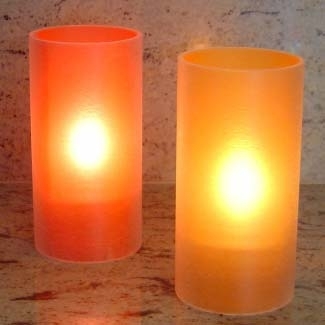 You might prefer the freedom of using coloured LEDs to totally transform a colourless candle lamp. Or maybe you'd rather make a powerful impression by mixing coloured LED candles and coloured lamps. The choice is yours, as you design your unique LED candle lighting! LED stands for light-emitting diode, a common electronic component of the present day. LEDs efficiently generate visible light through a phenomenon known as electroluminescence. LEDs are designed to produce the conditions that maximise electroluminescence for creating light. 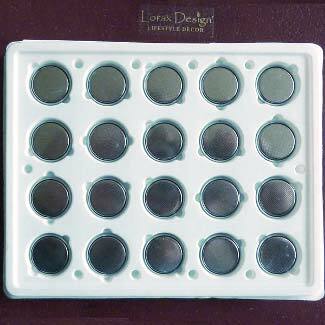 Semiconductor materials found inside LEDs produce an excess of electrons and a deficit in adjacent areas when a suitable voltage is applied. Because these two areas lie side by side within the LED, electrons naturally move from the area of excess to the area of deficit. As this movement occurs, energy is released in the form of photons (or light particles). It is precisely this process of producing photons that is known as electroluminescence. The semiconductor materials of the LED are enclosed in a transparent structure to allow the light to be transmitted beyond. You can find out more here: Light-emitting diode - Wikipedia. Like many other LEDs, the ones featured in electronic candles are highly efficient sources of light that produce virtually no heat. This lack of heat makes them a very safe alternative to both wax and oil candles.